claimed to be Rebecca Ravenshaw." I love a good Gothic mystery, especially when it has a touch of romance in it. The plot of this one revolves around Rebecca Ravenshaw, a daughter of missionaries who was raised in India. Newly orphaned, she's just returned to her family's estate in England only to discover that there was another young woman claiming to be Rebecca Ravenshaw who arrived there before her. A young woman who subsequently died at Headbourne House and was hastily buried at midnight. Now everyone at Headbourne suspects that the real Rebecca is an imposter. And there's no one to verify her claim. Only a distant relative, Captain Luke Whitfield, who's handsome and charming, but not necessarily trustworthy; after all, he stands to inherit her estate if she can't prove she is the real Rebecca Ravenshaw. And if she does, will her fate be the same as the imposter's? My thoughts: I had a lot of sympathy for Rebecca's plight. Aside from Mrs. Ross, Rebecca's elderly chaperone (and Rebecca herself, of course), I didn't feel like I could trust any of the other characters in this book. Not even Capt. Whitfield. Which definitely added to the tension surrounding Rebecca's situation. I especially didn't like her French maid. And no one in the household ever seemed willing to tell her the whole truth about the imposter and what happened to her. Rebecca herself had a lot of pluck; I liked that she never lost her head even while she was losing her heart. My only complaint is that this story didn't read as fast as I think a Gothic mystery should; in fact, there were times that it dragged a bit, but maybe that's just because I was so impatient for everything to be resolved one way or another. 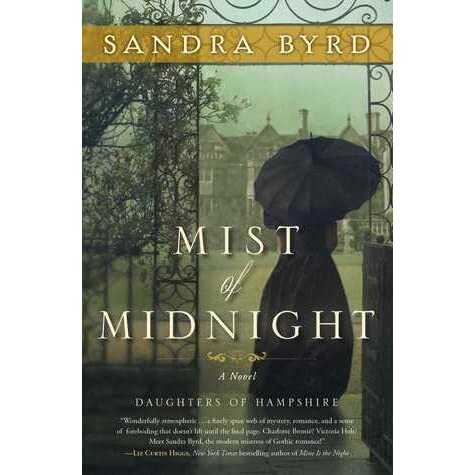 Towards the end, this book felt more like a Gothic romance than a suspenseful Gothic mystery, but overall, I ended up really enjoying Sandra Byrd's Mist of Midnight. This sounds intriguing. I'm sad to hear there's slow parts but if I'm in the mood I wouldn't mind them. I love a good Gothic mystery, but I agree that this one had slow sections...and maybe a bit heavy on the romance angle rather than a suspenseful mystery. The cover is what drew me in, though. Hard to resist a Gothic cover! Hard to resist a gothic mystery, especially one with a romance element. :) OK so it kinda made me pause about the dragging parts but I'm glad to hear you still enjoyed the overall story so I might want to add this to my wishlist. I've liked other Byrd novels, so I'll definitely have to give this one a go. I love gothic mysteries, too, so this definitely sounds like something I'd enjoy. Thanks for the rec! Oooh, this one sounds pretty interesting! I don't think I've ever read a gothic mystery before. I might have to give one a try!